Spring has reached the Northern Hemisphere. March has come and gone bringing with it the first blooms of the season, the chirping of the many song birds as well as the pollen and sneezing fits that come with it all. But the lack of a good rainfall has left us high and dry and in another year of drought. The Government asks us to conserve water, to take shorter showers, not to over water our lawns, and to use commercial car washes which recycle their water. This request I agree with, and will comply with to the best of my ability. Maundy Thursday will be celebrated at Scottish Rite on the 2nd of April. So bring your friends and family to join us in the coming of Easter. Spring Reunion starts on the 18th of April and the members of the different casts are putting many hours of their time practicing their lines and floor work. I hope to see many of you there to welcome the new members of our Ancient and Accepted Scottish Rite. 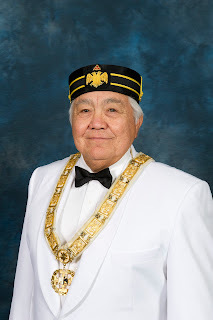 On another note, the officers of the respected lines of Scottish Rite are trying to plan events for the enjoyment of all the members and their families. I, being a member of one of those lines, would always welcome any and all suggestions. Call me, leave a message. My phone number is usually on page three of the newsletter “THE RITE WORD”. Be well and GOD BLESS YOU ALL !